By Vesna Tenodi - posted Tuesday, 9 October 2018 Sign Up for free e-mail updates! When I wrote that nothing about Australian prehistory as told by the Aboriginal industry nowadays should be trusted, some of the readers asked me why? Why is the Aboriginal industry so determined to hide the truth? Why are they so eager to fabricate the past, as well as present, losing all credibility in the process? One of the books deemed as offensive for containing accurate information about Australian prehistory is Cape York: The Savage Frontier by Rodney Liddell. It was self-published in 1996 when political correctness was on the rise. The book was the author’s response to academics who were “deliberately lying and distorting the truth on Australian history in the name of political correctness” (Rodney Liddell www.capeyorkbooks.com). Attempts to ban the book failed, and according to Liddell, The Savage Frontier is now more popular than ever. Political attempts to censor books and similar forms ofresearch or other publications often have that effect. Liddell was attacked for almost every chapter in the book. Speaking about the Aboriginal invasion of Australia, about the “sacred customs” of infanticide and cannibalism performed openly until just a few decades ago, or about morphological analysis of skeletal remains was deemed unacceptable under the new political regime. Liddell remains unapologetic and is still collecting the facts as learned from his Aboriginal informants. Before contemporary researchers such as Liddell there are other sources of the ‘forbidden past’ which are increasingly difficult to access. What the authors have in common is that they acted out of love for Aboriginal people, dedicated their lives to examining and recording the Stone Age culture as they witnessed it, kept helping the tribes and advocating for them, and urging the government of the day to treat the tribes with more compassion. Those calls were ignored. But today, the Aboriginal industry claims that “telling the truth and helping the tribes is just another form of invasion” and threatens legal action against anyone who offers constructive criticism or mentions some unpalatable facts about Aboriginal past and present. Long before Rodney Liddell revisited some politically undesirable facts such as the ever-present problem with Aboriginal violence, British explorer George Gray and humanitarian Daisy Bates detailed the same brutal mindset and violent customs they observed for decades which they recorded in detail in their journals. 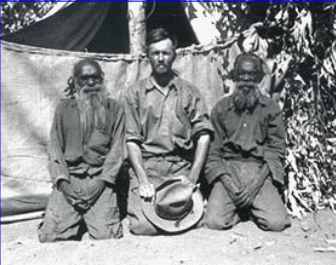 More recently, Ted Strehlow (1908–1978), an anthropologist who studied the Aranda people of Central Australia, documented tribal life for forty years (Fig 1). He amassed what is possibly the greatest collection of Aboriginal artefacts and other items ever. Much like Grahame Walsh, who documented PreAboriginal rock art and was attacked by the Aboriginal industry for his findings including that there was a more technologicallyadvanced people inhabiting Australia long before the arrival of the Aboriginal tribes, Strehlow too fell out of favor when he asserted that ‘real’ ancient culture was well and truly extinct and was replaced with a fake culture as devised by the Aboriginal industry. With the rise of the Aboriginal industry which is well-known to no longer allow for free thinking, Strehlow too (just like Grahame Walsh discussed in prior articles) went from glorified to vilified, and was betrayed even by his closest friends. Walsh was vilified for committing the unforgivable sin of attributing Wanjina and Bradshaw rock art to a pre-Aboriginal race. Strehlow’s sin? He refused to hand over his privately owned collection of artefacts, etc., to contemporary tribes. The collection consisted of the photos, songs and stories he gathered, as well as the archaeological and ethnographic items entrusted to him by the Aboriginal elders. This article was first published in Pleistocene Coalition News. Vesna Tenodi is an archaeologist, artist, and writer based in Sydney, Australia. She received her Master’s Degree in Archaeology from the University of Zagreb, Croatia.